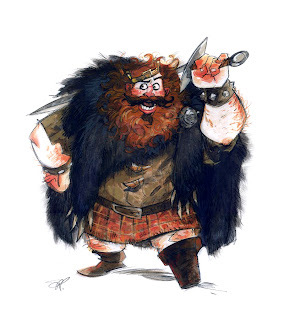 Here is an early character sketch of Merida's dad, King Fergus from the Pixar film "Brave". We always knew we wanted a blocky, furry, jovial chunk of a guy. I dashed out this painted sketch early on trying to capture some sense of his personality. Brilliant artists Carter Goodrich, Matt Nolte, Steve Pilcher and Pixar's smart character and sim departments created the amazingly realized Fergus that actually appeared in the film. very cool. Love that design. Awesome ! But tell me, Daniel Munoz Lopez drew for it, didnt he ? Jules -- Daniel did indeed work on Brave and did some great versions of Fergus along the way. Nobody seems to have asked about this yet, but I was wondering: Why weren't you eligible for the Academy Award as a co-director. And why didn't the other two mention you in their acceptance speeches?